It’s a fun one, but I had a hard time trying to come up with something I really liked. I’m glad I took the time because I really LOVE how my card turned out. I went back to last year’s National Scrapbooking Month’s promotion, Dotty For You, for the paper. Still absolutely love it and I’ve got lots left. 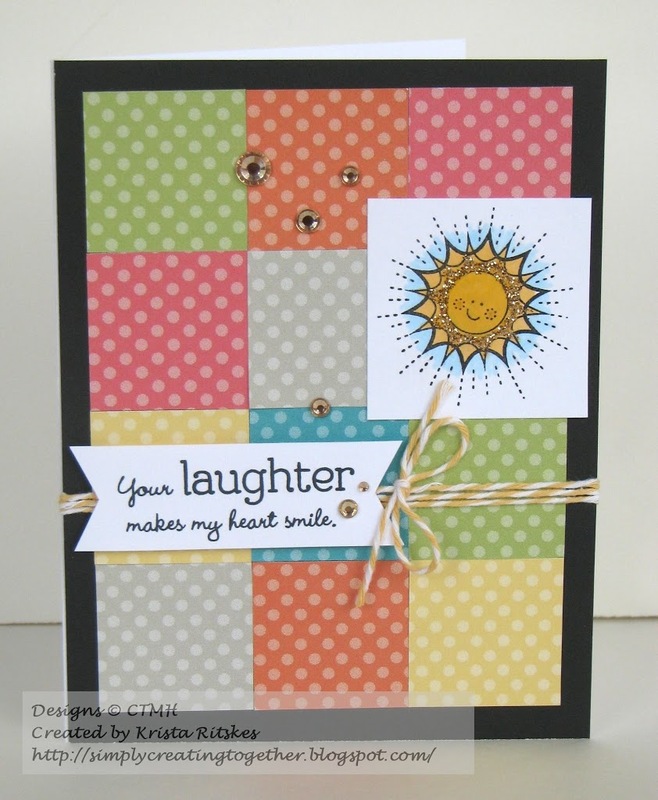 The stamped images come from the Close To My Heart current promotion for National Stamping Month, called You are My Happy. I stamped the sun and the sentiment in Archival ink and then coloured the sun with the CTMH alcohol markers. Tied on some Creme Brulee baker’s twine and added some Almond Glitz Gel and Tan & Brown sparkles. Very happy with it. Now, get crafting. I’d love to see what you come up with. Don’t forget to link up at Atlantic Hearts. You may be chosen as top three! I really like this card, and so happy you took your time with this, I might just have to scraplift this. What a happy card! This will certainly bring a smile to the person who receives it so be sure you give it away to someone! I will definitely be giving it away, probably to my sweet girl when she’s having a hard day.